Please click HERE to view the final report. Green Spine Connection – Identify a feasible connection between the terminus of the Green Spine Phase 2 project at Cass Street and Howard Avenue and the I‐275 Greenway, prioritized in the recently updated Countywide Greenways and Trails Master Plan. 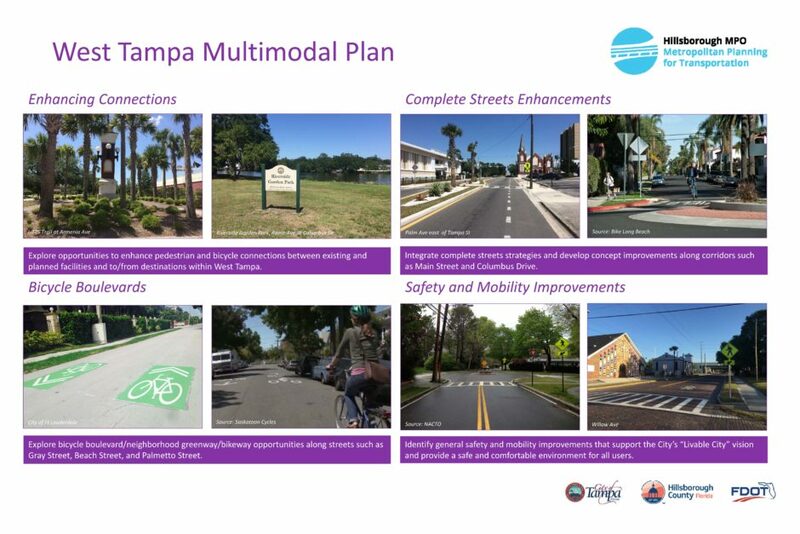 Howard Avenue and Armenia Avenue – Hillsborough County and the City of Tampa have made recent enhancements to Howard Avenue and Armenia Avenue north of Columbus Drive with the addition of buffered bicycle lanes and some on‐street parking. 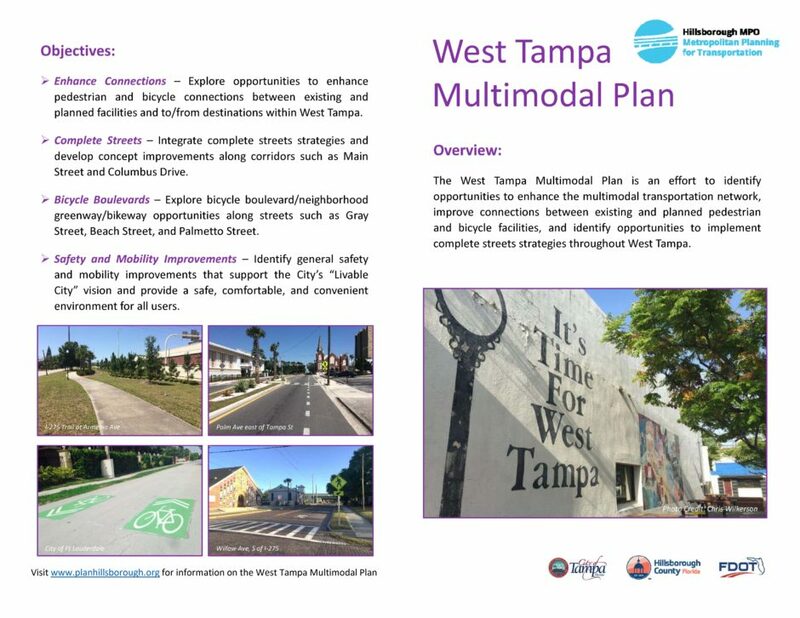 Coordinate with the City of Tampa and Hillsborough County on opportunities to improve pedestrian and bicycle facilities on Howard Avenue and Armenia Avenue between Kennedy Boulevard and Columbus Drive. 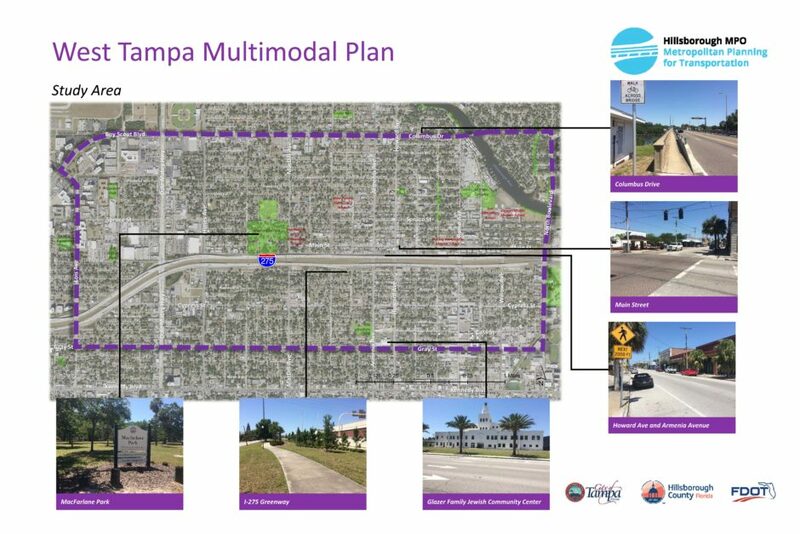 Main Street between MacDill Avenue and Rome Avenue – Develop conceptual improvements that enhance mobility options and support economic development along Main Street. It is anticipated that these improvements may include appropriate traffic calm strategies, improved sidewalk connections, signalized and un‐signalized intersection crossing enhancements, opportunities to better define on‐street parking, and general multimodal safety enhancements. It is envisioned that the identified improvements would tie‐into the West River Master Plan identified improvements for Main Street. Columbus Drive between Himes Avenue and North Boulevard – Identify potential intersection and crossing improvements for pedestrians and bicyclists along Columbus Drive. Additionally, the Consultant shall revisit the Walk‐Bike Phase I Plan recommendation for a road diet along Columbus Drive from west of Rome Avenue to North Boulevard that will include a review of crash data, traffic data, and apparent design constraints. Improved Connections – Explore opportunities to enhance multimodal connections between improvements identified in previously completed plans and studies, including but not limited to Walk‐Bike Plan Phase I and II, Countywide Greenways and Trails Master Plan update, Spruce Street Pedestrian and Bicycle Improvements, and the Dale Mabry Pedestrian Overpass Feasibility Analysis.